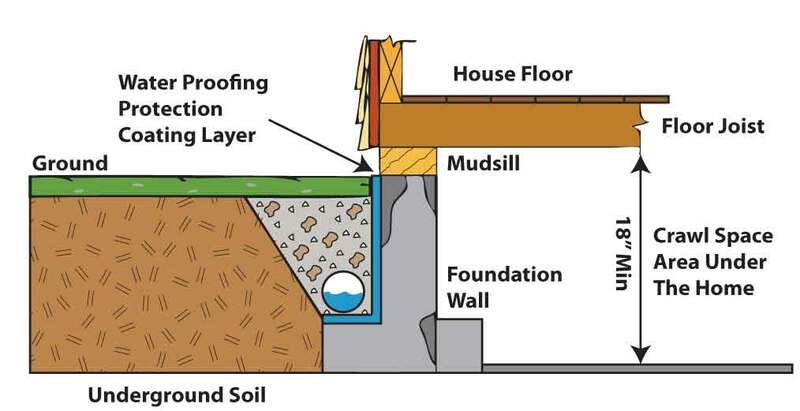 This diagram shows a typical drain tile installation along the outside of a crawl space foundation. In residential home construction, a drain tile system is a means for ensuring that ground water doesn't infiltrate a basement or crawl space but instead is directed away from the house before it can enter. While some homes may never have need for a drain tile system, it is a good feature to have since you never know when a period of heavy rain or rapid snow melt might cause catastrophic water problems in your basement or crawl space. In modern applications, drain tile isn't tile at all, but a system of porous plastic PVC pipe or flexible plastic pipe that is laid beneath the ground around a home's foundation. 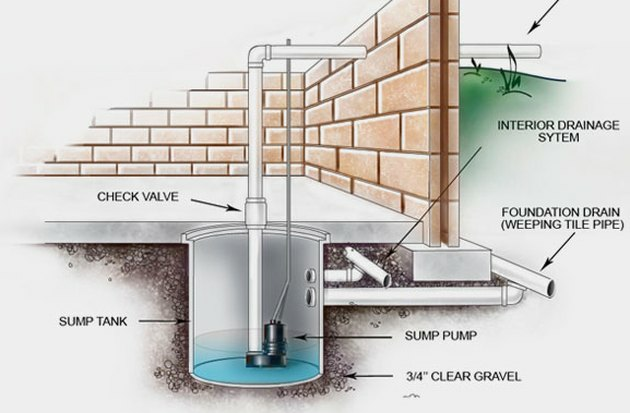 It is intended to collect the water before it can enter a basement or crawl space, and it either directs the water downhill away from the home's foundation using gravity or directs it into a collection pit where an electric sump pump can remove it from the house. In some systems, the piping may run to a distant drainage pit buried underground, while in other systems the piping or sump pump dumps the water onto open ground where it can run into storm sewers or filter into the ground. A drain tile system can either be installed around the outside of the home's foundation, or around the inside of the foundation, beneath the floor slab. When it is installed as part of the original construction, the drain tile piping is usually buried in the ground around the outside of the foundation, and sometimes around the inside of the foundation, as well. The use of drain tiles originated in agriculture over 2000 years ago. The Egyptians and Babylonians used drainage techniques to remove excess water from the soil and improve crop growth. In its original form, these systems were made from segments of clay tile. In spite of centuries of use, field drainage systems weren't used in America until Scottish immigrant John Johnston installed clay tiles on his farm in New York in 1838. His wheat production and profit per acre so exceeded his neighbors' that he was disliked by many. Johnston was not secretive about his methods, however, and in 1860, Henry French wrote a book that had such a profound effect that these drainage systems were renamed French drains. 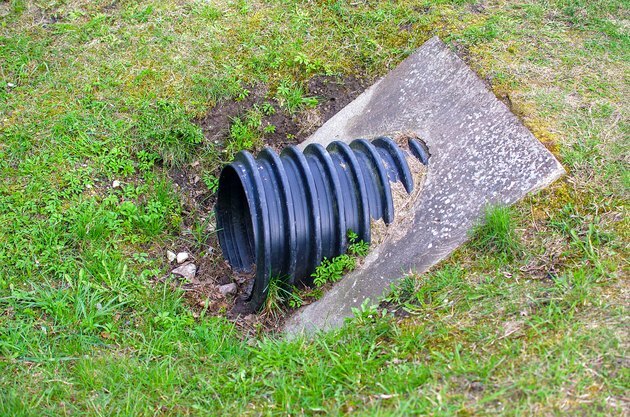 Drain tile is the term most commonly used today, but in some regions of the country, such agricultural drainage systems are still referred to as French drains. Other terms you might see include footing tile, weeping tile, perimeter drain, perforated drain, and foundation drain. Water enters the pipe and flows away from the foundation to open daylight. The principles of field drainage systems are similar to those in play when drain tile is used in residential construction. The purpose of drain tile around your house is to collect water around your basement foundation and channel it to one of two places. If you live in an area without a slope, the water flows to a sump pit in your basement where it is then pumped out away from the foundation. Alternatively, if you live on a lot with a sufficiently steep slope, the water runs downhill away from your foundation to some daylight exit point. The pipe should be sloped at a minimum pitch of ¼ inch per foot, although a steeper slope is better. The whole system functions very simply and efficiently by creating a path of least resistance for water to follow. 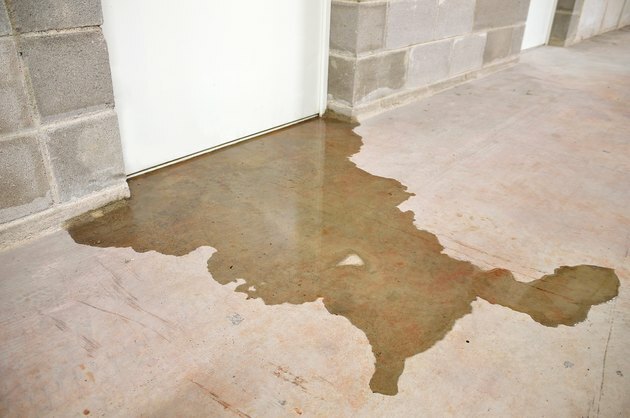 This means water is less likely to seep into your basement through any small, unnoticed cracks in the foundation or slab. 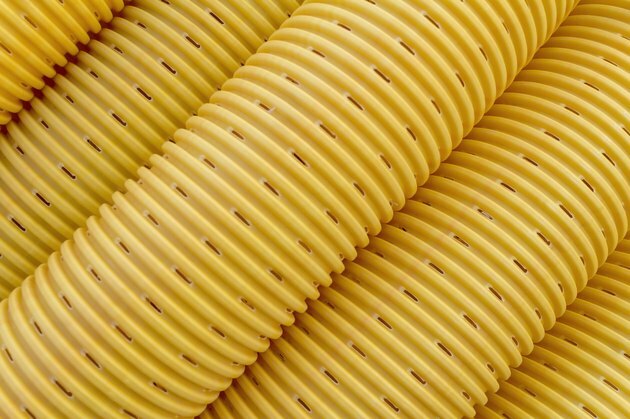 Corrugated flexible plastic pipe is usually yellow or black and perforated to let in water. There are two major types of drain tile pipe. One type is a rigid PVC pipe with holes on one side. The holes are placed facing down, and water makes its way into the pipe from underneath. PVC pipe comes in 10-foot lengths and, because it is rigid, it requires corner fittings to navigate around the house. PVC pipe is crush-resistant to 3000 pounds and costs about $0.65 per foot. A second type of drain pipe is corrugated flexible plastic pipe with perforations (small slits) that let water into the pipe but deter large soil particles from entering. Flexible plastic pipe can be purchased with a fabric covering that prevents small soil particles from entering the pipe. Without the fabric covering, this pipe costs about $0.40 per foot. It is cheaper than PVC pipe but has a greater risk of being crushed during backfill of the trench. Four-inch diameter piping is the standard size for foundation drainage systems, though diameters can range from 2 to 18 inches. Drain tile is best installed immediately after the foundation footer of a new house is laid and before further construction has begun. The pipe is typically installed in a 5- or 6-inch-deep trench that runs alongside the footer. Next, the drain tile is covered with at least 3 feet of round, washed gravel that is 1 to 1 1/2 inches in size. This gravel is too big to fit through the holes or perforations in the pipe but makes a great filter for the water as it travels to the pipe. After the gravel layer comes a cover material—a porous fabric, such as roofing felt or landscape fabric, that allows moisture to seep through while blocking soil. Once the gravel cover is in place, soil is piled up to finish the job. Water in the basement indicates a drainage problem. Do I Need Drain Tile? Today, most building codes require drain tile around all concrete and masonry foundations that retain earth and enclose habitable or usable space below grade. According to the 2012 International Residential Code, however, there is one exception to this requirement. A drainage system is not required when the foundation is installed on well-drained soil or a sand-gravel mixture soil. You can test your soil to determine the type you have, but regardless, builders will often advise putting in some type of foundation drainage as an extra level of security. Drain tile systems are fairly affordable and easy to install during the early phases of home construction, before the foundation has been backfilled. Given that you are protecting your home from water damage, it is probably worth having the system installed if you are contracting a new home construction. And it is a definite plus to look for if you are buying a home—either a newly constructed home or an existing dwelling. Where water problems begin to appear in an existing home, drain tile can be retrofitted to eliminate the problem. Having drain tile installed on an existing home in order to correct basement water issues is very costly and labor intensive, but it may be the only solution. It requires major excavation around the entire foundation, or inside the existing basement, or both. Outdoors, you may need to remove landscaping—including decks, patios, steps, and sidewalks—in order to install drainage pipes. It is more common for drain tile to be retrofitted around the inside of the house foundation only. A channel is cut into the concrete slab near the foundation walls, then drain tile piping is laid beneath the floor, leading to a sump pit. The floor is then patched over. When groundwater begins to collect beneath the slab, it is collected by the drain tile piping and directed to the sump pit, where the pump automatically kicks in and pumps the water out of the house. This can offer solution for older homes that were not fitted with foundation drainage systems when they were built. This drain tile system features drainage pipe both inside and outside the foundation wall, and uses a sump pump to remove the water. Installing an indoor drain tile system is no small feat, though. All flooring and furnishings will need to be removed, and you will face days worth of jackhammering and mess as the system is installed. And an interior system may not be as effective as a system that also integrates drain tile on the outside of the foundation wall. The advantage of exterior drain tile is that it intercepts and drains away ground water before it can get in. Water stains on your basement walls. This could be followed by serious flooding if action isn't taken. Puddles close to your home's foundation. Puddles could also mean that your yard is not adequately sloped away from your home, or that your downspouts are not moving water sufficiently far away from the roof. If groundwater is managed well, drain tile becomes just one part of a larger system of water management. Carefully grading the yard is important for directing water away from the foundation, along with roof gutters and downspouts.